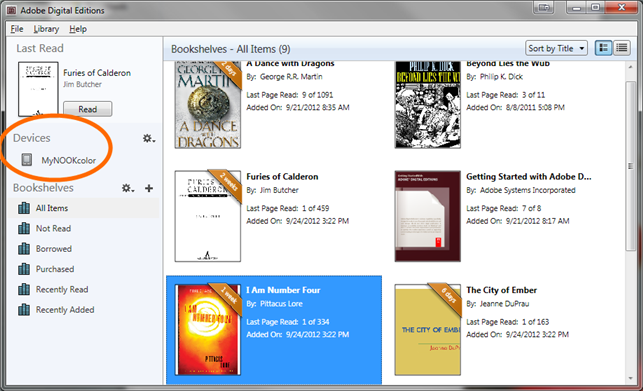 You can transfer downloaded ebooks to a compatible ereader using Adobe Digital Editions (ADE) software on your Windows or Mac computer. The NOOK GlowLight Plus doesn't use ADE to transfer ebooks and won't appear under "Devices." Instead, use these steps to transfer ebooks to your NOOK GlowLight Plus. Newer Kobo ereaders (Kobo Forma, Aura ONE, Aura H2O Edition 2, Aura Edition 2, and Clara HD) have OverDrive built into the device, so you can borrow and download ebooks directly from the Kobo catalog. Learn more about how OverDrive works on Kobo ereaders. Connect your ereader to your computer. Install and authorize Adobe Digital Editions (ADE) on your computer. Download an EPUB or PDF ebook to ADE from your library's digital collection. Downloaded ebooks should open automatically in ADE. In ADE, make sure you're in "Library" view (click the Library button in the top-left corner, if needed). Your ereader should show up under "Devices." You may need to accept a file-transfer prompt on your ereader in order for it to appear in ADE. Note: If you don't see your device, you can try these steps. If those don't work, you may need to install some additional software. Please check your ereader's documentation for more information. 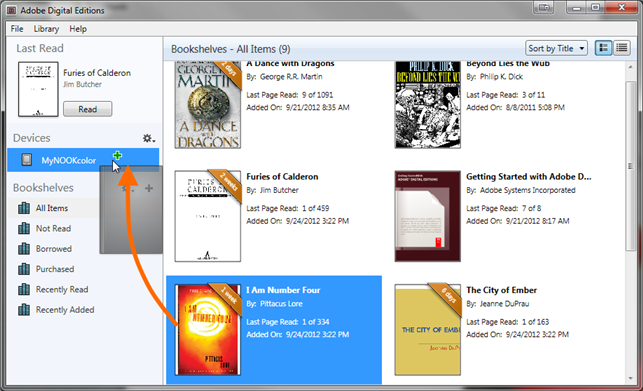 Click and drag an ebook over to your device. Note: During the transfer process, your ereader will be automatically authorized with the same Adobe ID or OverDrive account you used on your computer. Once the transfer is complete, you can disconnect your device and start reading. Note: If you're having trouble finding books you've transferred to a NOOK ereader, see this article.